American National Bank – SAVED! The American National Bank building, which opened in 1954, was billed as the “most modern, efficient and service-minded bank in Texas.” For their new headquarters, bank officials hired prominent designers who integrated art and architecture into a thoroughly modern public/private building. The lead designer was Austin-based architectural firm Kuehne, Brooks and Barr (1942-1960) and the interiors were designed by Florence Knoll (1917-) who integrated a large mural by local artist, Seymour Fogel (1911-1984). 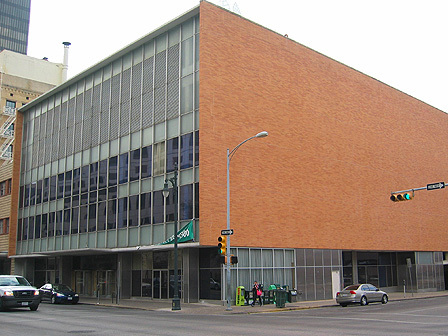 Later, the building was acquired by the State of Texas for the offices of the Texas Comptroller of Public Accounts, who occupied the building until 2005. UPDATE: This building has been saved! It has been returned to use as part of Austin’s vibrant downtown.